Leather is a collective term for all hides and skins which have been tanned. These can come from any type of animal. Because it is a by-product of the meat industry most leather is produced from cow, sheep, goat and pigskin. There are smaller amounts of deerskin and exotic leathers such as crocodile, lizard and the like. 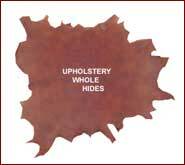 The majority of leather products are made from cow-hide especially in the upholstery trade as these provide the skin area needed to cut the largest panels. Sheepskin has a soft handle and is used predominantly for clothing. Pigskin is used for clothing especially in its suede form, and also in the lining of footwear. The quality of leather is determined mainly by the condition of the grain/surface. In general, the animals from poorer countries are less well nourished and less well tended and so have more surface damage such as scars, insect bites and disease marks. Those from richer countries have a better grain quality and are much cleaner so demanding a higher price. As a rule the cleaner the surface of the hide, the more the natural the look of the leather can be preserved through the sparse use of dyes and pigments. Often leather is printed/plated to produce a special effect or even enhance an already natural grain. However, it is rare for a hide to be completely free of defects; indeed many prefer some of these to be seen as they serve to add character to the leather. Often though the surface of the hide is too rough to use as it is. It then has to be buffed (or corrected) and pigments more heavily applied to create a cleaner surface. The thickness of hides before tanning can vary significantly. To obtain a uniform substance the hides are fed through a splitting machine. This yields a grain portion and an underneath flesh layer that is called a split. Splits need heavy pigmenting and plating to provide a clean surface and so have less of the natural look of a grain leather. Suede is made predominantly from good quality split which is buffed into a fine napp that gives it the familiar velvety look. A similar process is sometimes used on grain leather which can produce an ultra fine sueded finish commonly called 'nubuck'.